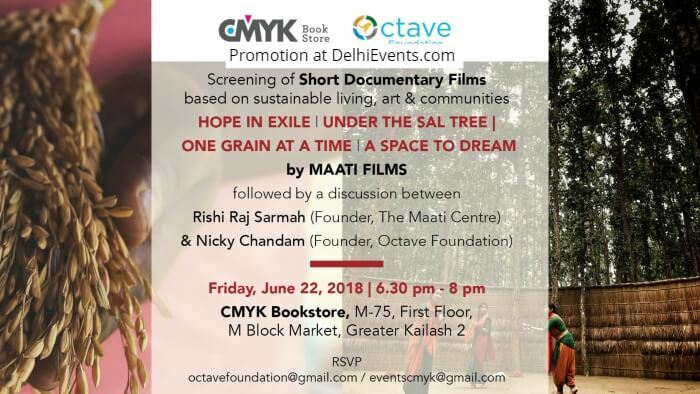 Event Description : Octave Foundation and CMYK presents Screening of Short Documentary Films based on sustainable living, art & communities by Maati Films. Tibetan Refugee Self Help Center was setup by Tibetan refugees in Darjeeling on October 2, 1959 after they followed Dalai Lama and escaped from Tibet. The refugees adopted the principle of self-help so that they could become self-independent and completely rehabilitate themselves in a foreign country, which they did gracefully. The journey from Tibet was followed by 20 young artisans who believed in a dream of rebuilding culture in the foothills of Himalaya. After conceiving this festival in 2008, legendary theatre director and dramatist, Heisnam Kanhailal chose Rampur in Goalpara to host this festival by collaborating with Bandungappa Kala Kendra run by his student and noted Assamese theatre personality, Sukracharya Rabha. Over the years, Rabha has been bringing theatre groups from across the world, albeit quietly. Under the Sal Tree, this year was held between December 14 to 17, with support from Sangeet Natak Akademi. A young man in Rampur, Sukracharjya Rabha, realised that his community could be saved by plays. “We set up a drama troupe in 1998,” says Rabha, now 40, who named it Badungduppa, after a musical instrument popular with the community. Early performances dealt directly with alcohol abuse. “The troupe members also formed a committee to protect the sal forests,” says Rabha. A seed library is preserving and promoting rare Assam rice varieties – one grain at a time. In the foothills of the eastern Himalayas in Assam, Mahan Chandra Borah is racing against time to stock up nearly-extinct and rare indigenous rice varieties, one grain at a time, in his unique seed library to help secure genetic diversity for climate resilience. Borah’s “Annapurna” library is “North East India’s first indigenous seed saving library” that seeks to collect and promote the cultivation of heirloom rice landraces of the region in the wake of climate change. A history graduate-turned-farmer, he started the seed bank about 12 years ago, from Meleng in Assam. Backed by traditional wisdom on diverse rice cultivars imparted by the elderly in his village, he fanned out to hamlets across the northeastern states in search of these treasures. He subsequently converted it into a library. His assemblage includes aromatic, sticky, black, flood-tolerant and hill rice among others. A group of young thinkers undertook a unique initiative in the field of community movement in the Majuli district of Assam. The group, collectively known as the ‘Maati Community Movement’ has constructed a community children’s library in one of the most densely tribal populated parts of the district. Majuli is known for being one of the world’s largest inhabited islands that supports an idiosyncratic biodiversity. In the last few years’ tourism in Majuli has boomed, thanks to the rising consciousness towards social media usage. But sadly, tourism has remained confined to the areas of Sattras or Vaishnavite Socio-Cultural institutions, founded by the Assamese polymath and saint-Srimanta Sankardeva.